Your specialized cable grip manufacturing supplier partner. 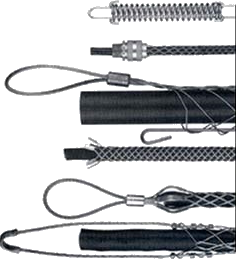 For more than 20+ years, Amtec Corp has been specializing in manufacturing quality cable grips in the USA. Combined, our key staff has over eighty years of experience in manufacturing wire mesh cable grips. Amtec Corp. is ready to assist you in your wire management needs. All our cable grips are manufactured 100% in the USA at our 30 Center Parkway, Plainfield, Connecticut location. We offer a wide variety of grips, fittings, adapters and specialty applications that include materials such as Stainless Steel, Tinned Bronze, Galvanized Steel and Non-Metallics. Manufacturing for worldwide applications, from distribution to OEM’s, we have the engineering staff to custom design a grip to suit your needs. Make Amtec Corp. your choice for quality wire mesh cable grips.